This week at the Rumsey-Polk site, archaeologists continued to measure, map, describe, draw and photograph the site’s cellar holes, pits, posts, wooden sills, and remains of former structures made and used by the 18th and 19th-century tenant farmers (photo). Over 240 of these “features” were meticulously and carefully documented to enable archaeologists to understand what these features are, when they were made, and what we can learn from them. This documentation and mapping must be done before we can dig the best features. We also had a visit by DelDOT representatives. What a difference a week makes! Over the past week at the Houston LeCompt excavation, most of the mechanical stripping has been completed revealing myriad features, and many intriguing artifacts. 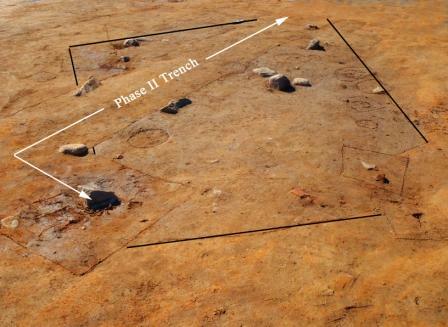 It looks like the site core contains the main house cellar, at least six possible outbuildings, a potential well, and a historic sheet midden. While the individual features are certainly intriguing, exposing all of these features in plan has definitely given us a much better understanding of the layout of this farmstead and how the historic occupants of this tenant house lived and worked. Moreover, we are starting to grasp how the farm was modified over time due to technological improvements and changes in the residential composition. For example, the carriage house may have been replaced by a garage in the early-twentieth century. 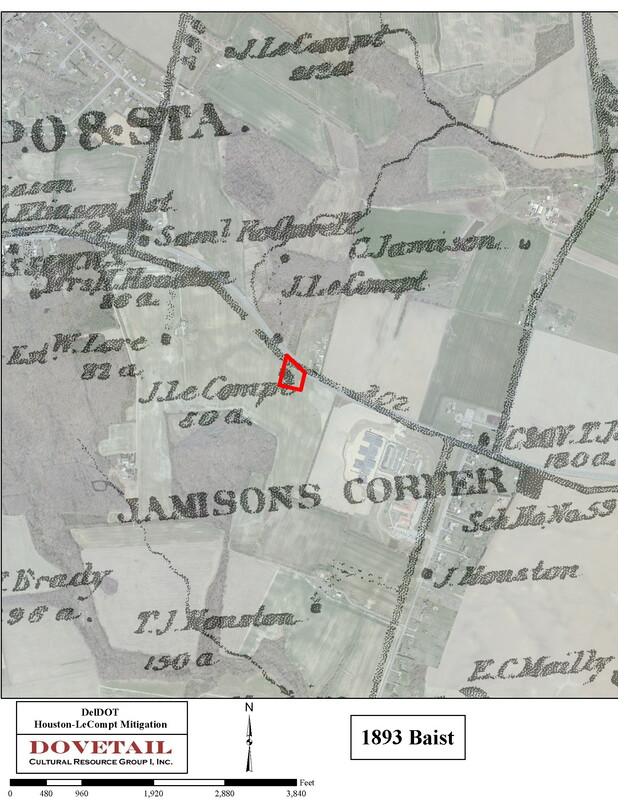 Preliminary evidence suggests that the carriage house was located behind the main house, while the possible garage was placed much closer to Boyd’s Corner Road, showing distinct changes in landscape use over time. We were visited by staff from the Delaware Department of Transportation this week so we could share our preliminary results with the project sponsors. We also had several members of the general public stop by. While some made plans to come see the site, others stopped by for an impromptu visit after driving by the road and wondering: “What in the world are they doing?” Whether their interest was spawned by the sight of our large, open expanse of our fenced area or their curiosity on why people would be on their hands and knees in a dirt patch in 100+ degree weather is not known…. The really exciting part of our work comes next week, when we will start digging into our exciting features starting with the house cellar. 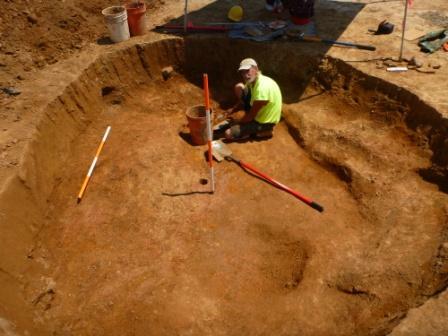 When Archaeological & Historical Consultants conducted their stellar Phase II archaeological work on this site in 2010, they exactly pinpointed the center of the root cellar and excavated a trench diagonally down the center. Their data will greatly help in our analysis. Tune in next week to see what we find! 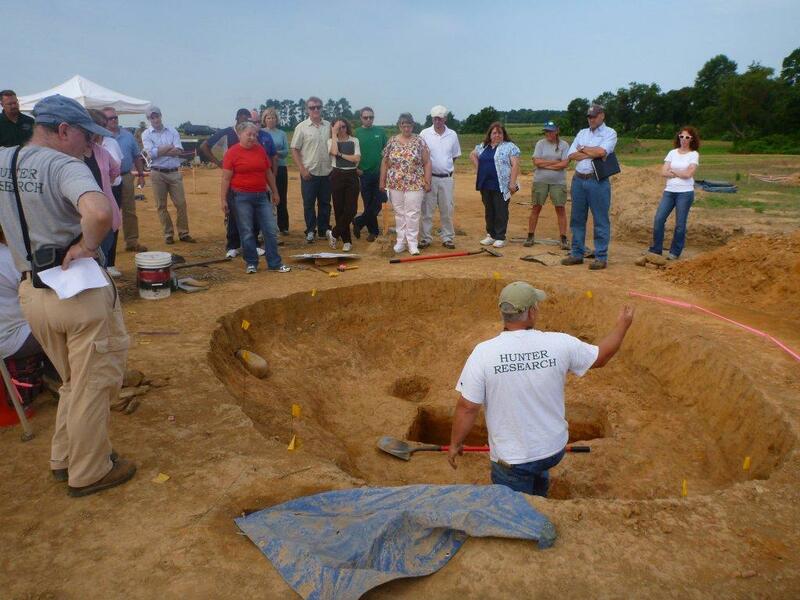 Dovetail President Kerri Barile discusses a feature with DelDOT Archaeologist Kevin Cunningham. This week at the Rumsey-Polk site, archaeologists worked through the heat and rain to document more “features” – cellar holes, pits, posts, and wells made and used by the 18th and 19th-century tenant farmers. We found one type of feature that is rarely preserved, remains of wooden sills that once supported “earthfast” houses and sheds. Earthfast structures had wooden foundations that decayed faster than buildings with stone or brick foundations. In the next few weeks we will record and map more than 525 features identified at the site — and then excavate several of the best ones to learn more about the lives of the people who lived at the site during the 18th and 19th century. One of the more interesting artifacts found last week was two fragments of a tortoise shell patterned teapot dating to the mid-18th century. Native American artifacts found this week included two spear or dart points, a 9,000 year old jasper Amos type and a 8,000 year old bifurcate, which remind us that Native Americans hunted and collected food at the site for thousands of years before Europeans arrived. Despite the heat, students and teachers from the Federal Highway Administration Summer Transportation Institute toured the site and joined us in a search for more artifacts. Volunteers from the Archaeological Society of Delaware also visited and toured the site. The last week of work on the Elkins Site saw a gathering of historic preservation specialists from the Delaware Division of Historic and Cultural Affairs, including State Historic Preservation Officer Timothy Slavin. This meeting enabled the team to share ideas with other specialists and to discuss interpretations and strategies for the site. Meanwhile, the Hunter Research historians have been following a trail of archival clues to help us identify past land uses and the people who occupied the Elkins site during the 18th century. Colonial land records have led us to the conclusion that what we now know as the Elkins farm property was divided into two farmsteads of approximately 100 acres each during the first four decades of the 18th century. The boundary between the two 100-acre tracts has proven somewhat elusive because the old boundary markers, mostly oak and hickory trees, are long gone. After some extensive analysis of the “metes and bounds” (the descriptions of the boundary lines in the deeds), we are now fairly confident that the area under current investigation is located on the northern 100-acre tract and that the boundary between the two tracts was just east of where we’ve been digging. A key piece of evidence is a remarkable deed drawn up by surveyor George Da Keyne in 1716. This deed recorded the conveyance of the southern tract from John Greenwater, a yeoman, to John Poullart (or Pullar), a weaver. 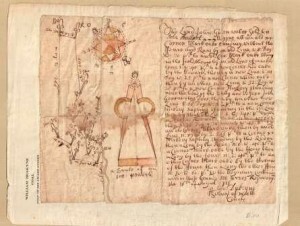 Da Keyne embellished the deed with beautiful drawings of a compass and caliper, an unusual flourish. The drawings remind us of pen-and-ink styles common to Europe’s Late Gothic period. Da Keyne no doubt meant to convey his skill as a surveyor, but simple trigonometry proves that the metes and bounds do not come close to forming the closed polygon shown by the accompanying map. 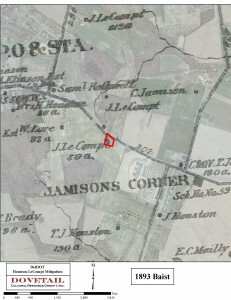 Errors such as these, which are common to colonial deeds, were no doubt introduced by topography and surveying technique; they simply reflect the state of the art at that time, not incompetence. Land Survey by George DaKeyne of the John Greenwater Property. August 16, 1716. Courtesy the Delaware Historical Society. While we are not yet certain of the 18th-century occupants of the Elkins site, we now have two leading candidates: 1). the Greenwater family from circa 1707 to 1741; and, 2). the McCool/Merriss family from 1741 to 1793. John Greenwater, Sr. was a Welsh immigrant who arrived in the colonies in the late 1690s. He was involved with the establishment of the Welsh Tract Baptist Church in Newark in 1701. Greenwater appears to have settled on the northern tract between 1707 and 1716 accompanied by his wife Elizabeth Patterson Greenwater and son John Jr. , who inherited the property after his father’s death in 1722. John Greenwater Jr. continued to own the farm until 1741, when he sold it to John McCool, Sr., a planter, who had two years previously purchased the southern tract. John McCool, Sr., and his family are of considerable interest since their ownership coincides with the many mid-18th century ceramics and artifacts being found at the site. So far we’ve traced four generations of the McCool family to the property: 1). John McCool, Sr. and his wife Sarah; 2). John McCool, Jr. and his siblings Thomas, George and Elizabeth; 3). Mary McCool Merriss, the daughter of John McCool, Jr., and her husband John Merriss, a blacksmith; and 4). the Merriss children Benjamin, Richard, Sarah and two other girls as yet unidentified. We’re looking forward to compiling more demographic data on these families to help us to develop the site’s historic archaeological contexts. 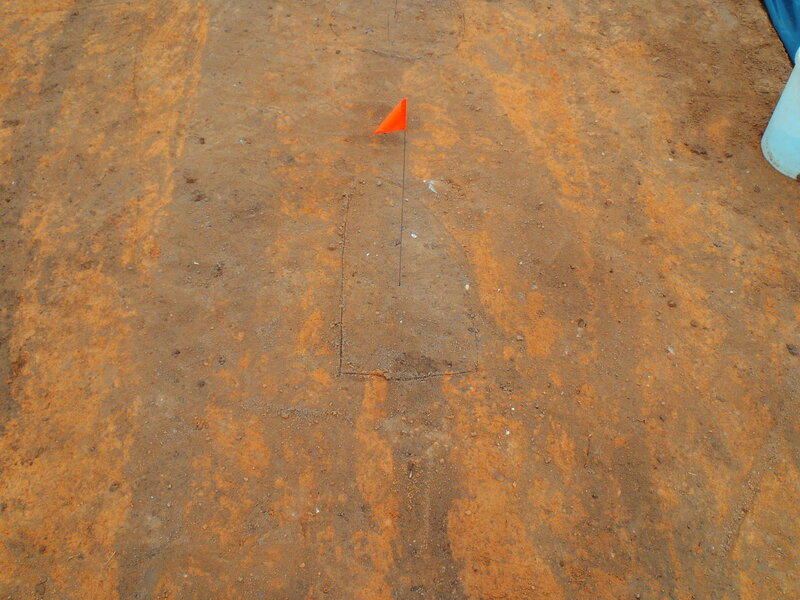 Crossing plow scars cut through a feature uncovered at the Houston-LeCompt site. At the Houston Le-Compt site we have met the enemy, and the enemy’s name is……plow scar! Work continued for a third week, and we have moved from digging sample units to mechanically stripping the plow zone from the 0.8-acre site core. After the main house burned in the 1930s, the area became an agricultural field that was plowed, and plowed, and plowed again. 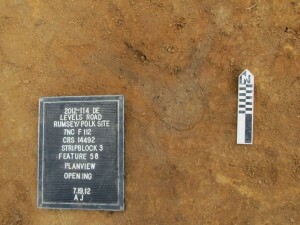 This activity left thousands of deep plow scars across the entire site. Plow scars are long shallow troughs left behind when a plow digs deeply into the earth while churning up the soil, leaving a linear dark stain. 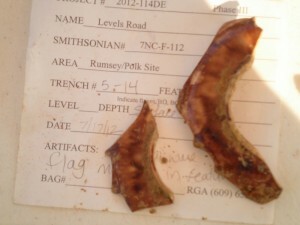 Plowing over the past 80 years has left an indelible mark on the archaeological record. The deep cross-cutting by the plow ran directly through all of the features left behind by past activity. Sometimes a single feature was cut by a myriad of plow scars, thus almost obliterating its original shape. Despite very muddled and complex soil conditions, the Dovetail team continued to tease out exciting details on this site. In addition to dozens of post holes, we have located the remains of what may be three buildings, including the root cellar of the main house. Although we have not yet begun excavation of this feature, an abundance of brick, stone and artifacts across this area are a sign of great things to come. Other features we have found include brick piers, what may be a rear yard sheet midden, and a dark stain where many horseshoes were found. Possibly a carriage house that was mentioned in archival records? We will spend the next week finishing our backhoe stripping and creating a site map, with feature excavation beginning in the weeks to come. Now if we can just get past those plow scars. Johnie Sanders, Morgan MacKenzie, and Nathan Sims begin to uncover the root cellar. 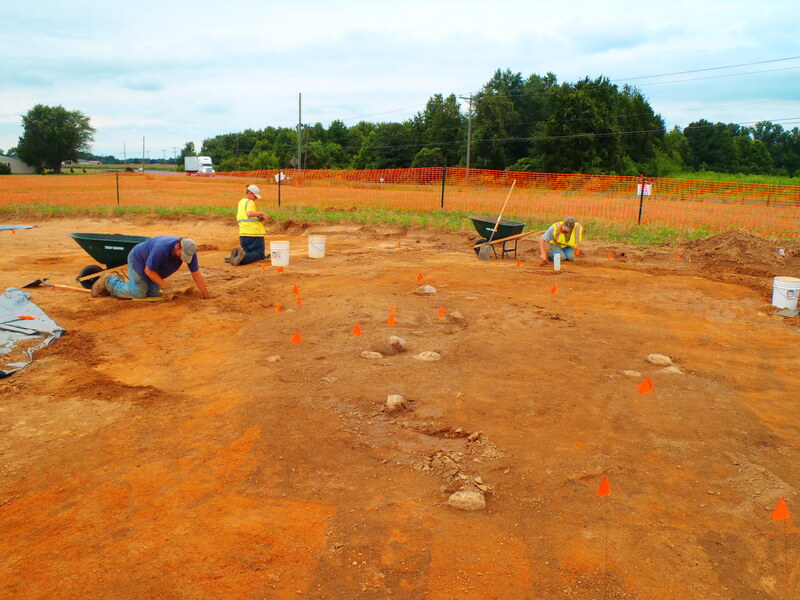 Fieldwork concluded this week on the Elkins site, with work focusing on bisecting the suspected post holes across the site and finishing the larger prominent features. As could be expected, some of the suspected postholes indeed turned out to be historic posts, while others are now interpreted as “non-cultural” disturbances caused by tree roots or animal burrows. Having sorted out which is which, we can now start to connect the dots, and, we hope, to the discern the configuration of fences that probably delineated garden and yard areas. Dismantling the stone side walls of the root-cellar revealed that crushed red brick mixed with loam was placed between the large cobbles during construction, evidently to prevent the otherwise dry-laid stones from slipping out of position. An entrance became apparent in the southwest corner of the root-cellar with a step at the base, implying that there was an entrance into the cellar from outside the house. The large circular feature has now been fully excavated, and although it remains puzzling, we now have additional data to help us work out what it is. 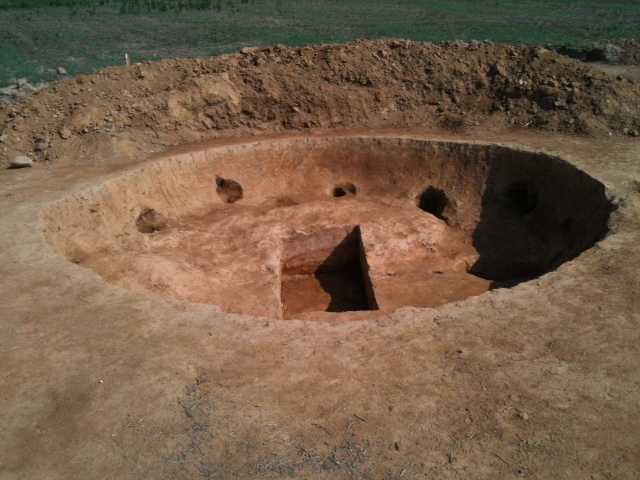 The rectangular excavation seen on the photo was cut by us through the center of the pit to examine the stratigraphy below the pit, and is not part of the original construction. The pit feature has an approximate diameter of 15 feet and extends three feet below the plowzone. The large post holes, positioned every three feet around the perimeter of the base of the pit, contain smaller posts ranging from four to six inches diameter and angled 10 degrees inward. Rocks originally thought to be positioned under each post are actually wedged under and over the posts to prevent them from shifting or falling inward. 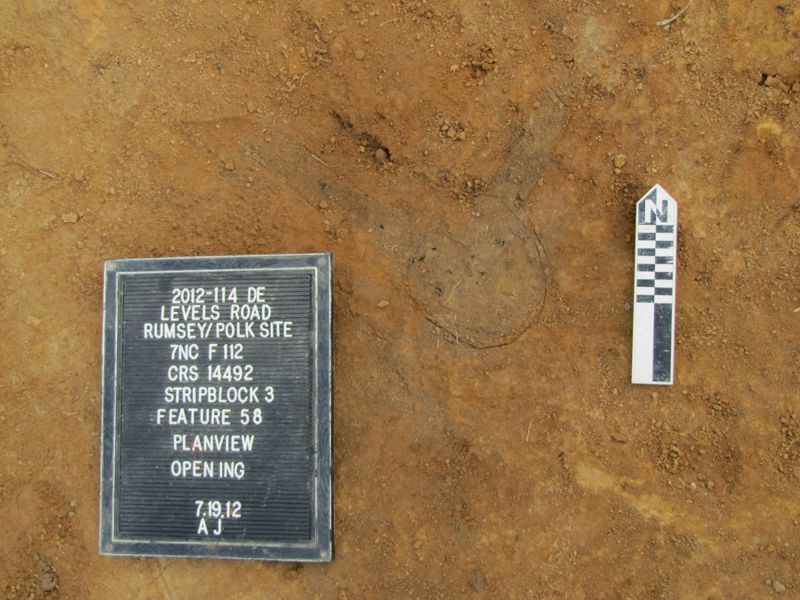 The slabs recovered from the upper center of the fill may be pieces of one larger broken slab. No other artifacts have been recovered from this enigmatic feature. So we are still wondering: what is it? We have had several visitors to the site with interesting ideas (see last week’s post), but none are as yet completely satisfactory. 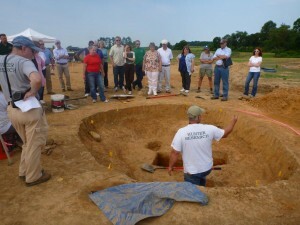 A competing possibility to a wolf trap/pit is a “field root pit” type of root cellar used to store staples such as potatoes, carrots and turnips. Field root pits are often rectangular but can be circular. Some also have peaked roofs. As always your thoughts, are helpful and welcome. 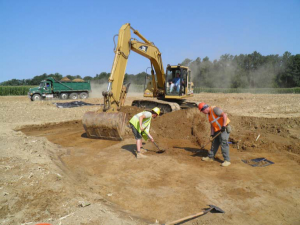 Excavation of the Houston-LeCompt site made great progress this week thanks to the crew’s hard work and much nicer weather since our last update. Our process of sampling the plowzone using ten 2×2 meter units is complete! We have sent over 6,500 artifacts to the lab to keep them busy washing, sorting, and analyzing already. Yikes! We are particularly excited to hear back from them about some specific items we found, including jewelry, ceramic doll parts, and several coins. We also started our next big task, which is removing the plowzone from the rest of the site using heavy equipment. Even at the bottom of our sample units we were finding features, and as the heavy equipment get closer to the foundation area located during the site evaluation, we expect to be finding a lot more. 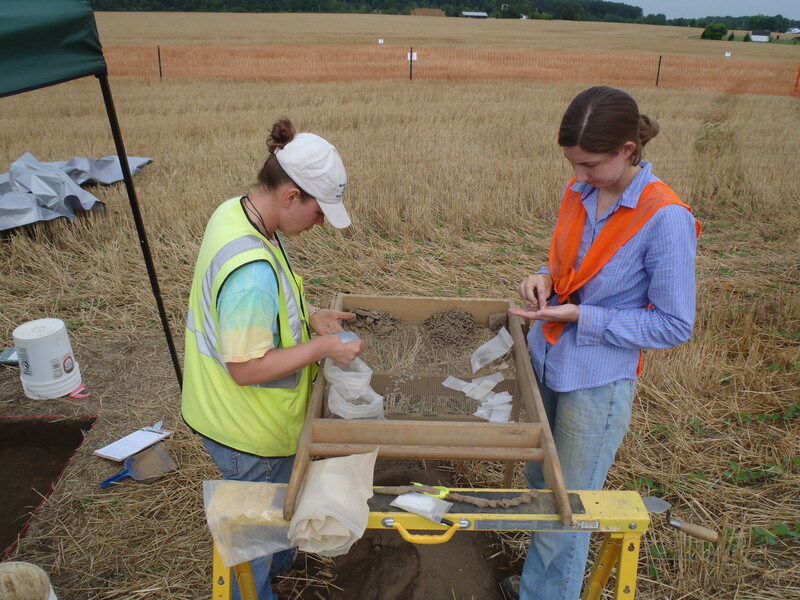 Along with the archaeology, we have also continued to do archival research and GIS mapping of the site. 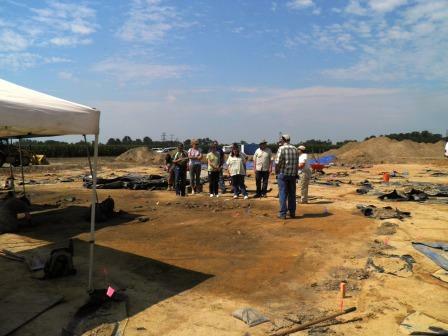 What we have found so far is already helping us to rethink the history of this site. It now appears that the circa 1770s Houston house may have been located west of our site, and we are uncovering the remains of a mid-19th century home instead. The house, built either by Richard Mulford or James LeCompt, was used as a tenant house in the late-19th century. 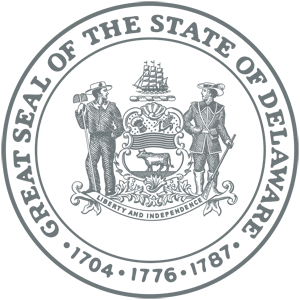 We used GIS mapping and completed a study called “georeferencing”–tying historic maps to modern features and aerials through an overlaying process using specific geographic features as references)–to aid in this identification. Maps from 1849, 1868, and 1893 are helping us with site interpretation, and the marriage of these documents and archaeological finds is coming together very nicely thus far! This coming week we are upgrading to even heavier equipment. A larger backhoe will help us remove the plowzone faster and get the crew back to what we all love doing as archaeologists, playing in the dirt! Our goal is to have the site completely cleared during our next eight-day work week, so that we can focus the rest of our time on investigating the subsurface features that are revealed. We are all looking forward to finding out what the root cellar fill has been holding for the last hundred or so years, just waiting for us to find it again. The first week of the Rumsey-Polk Tenant-Prehistoric site Phase III archaeological fieldwork excavation was off with a bang… and a clang – of the big mechanical excavator! 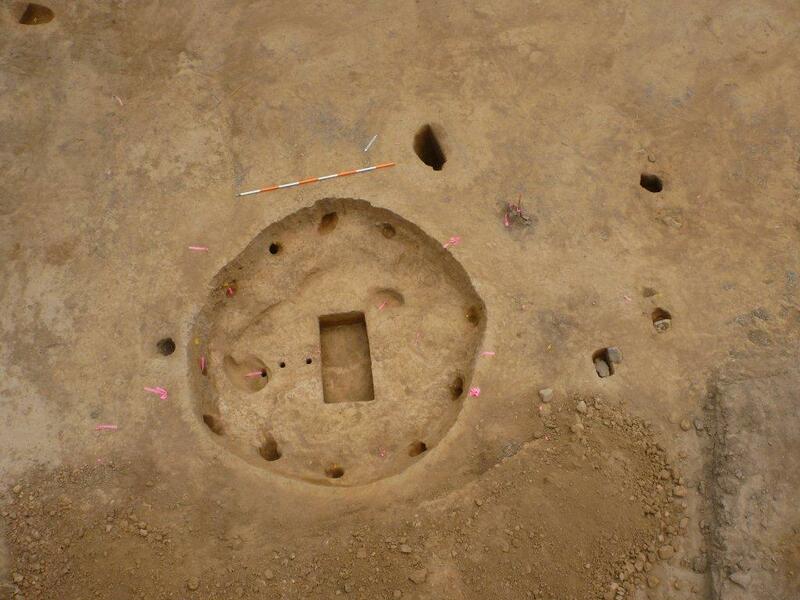 To our surprise, traces of over 120 stains, pits, posts, and wells, otherwise known as “features,” have been found in the northern part of the site. Features like these can tell us a lot about the people who once called the site “home.” We expect to find many more exciting features as we move south to excavate near the former house in the coming weeks. The former residents of the site included prehistoric Native Americans, and later was occupied by tenants of the Rumsey, Polk, and Cochran families between 1740 and 1855. Along with using an excavator to remove about one acre of topsoil to search for features, our crew has also worked hard through the summer heat, sifting soil from several areas of the site to find artifacts that once belonged to the site’s occupants. 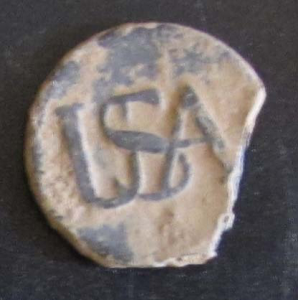 Artifact of the week (below) is a pewter “USA” Continental Army button worn by a Revolutionary War soldier sometime between 1775 and 1783. Work this week at the Elkins site concentrated on feature excavations. Situated near the base of the knoll on which the stone-lined root-cellar lies is a low un-mortared wall consisting of limonite and local cobbles. This wall traverses and blocks a now-shallow gully that eventually drains into Scott Run. Soils situated on the downstream side of the wall consist of sorted sands, while soils located on the upper side consist of finer sands and silts, suggesting they had settled out from an impound of water. We believe the people who lived on the knoll built this damn to hold back water either from a natural spring head or from rainwater passing down a gully leading to Scott Run. This impound would have provided drinking water for their livestock. West of the cellar hole, the small sunken-floored building described last week appears to be an out-kitchen, based on the evidence of numerous bone fragments, oyster shells and utilitarian ceramic red earthenware sherds from its floor. Out-kitchens are separate structures situated near a house built to prepare and cook food without heating up the house during the warmer months, hence they area also known as summer kitchens. We currently estimate that this out-kitchen was 16 feet long by 8 feet wide. The nearby stone-lined root-cellar hole now appears to lie within the center of a building measuring 16 feet wide by 16 to 24 feet long. These measurements are based on the absence of gravel at the bottom of the plowzone around the root-cellar. Excavations within the northern portion of the root-cellar recovered the base of a light cobalt “flip glass”, also known as a tumbler (Photo). Other high quality artifacts recovered from the root-cellar continue to suggest the people who once lived there were either wealthy or had access to expensive items. One of the continuing debates among archaeologists studying the 18th century is when and how a “consumer” society developed in the American Colonies: a society in which people became interested in defining themselves more by the things they owned than in more traditional means of showing status such as social class and landownership. Our 301 sites look set to contribute to that debate. The feature we have for some time considered to be a well, located 45 feet from the root-cellar, has now become one of the most puzzling features at the site, and possibly on the Route 301 project to date. This circular feature is situated on the side of the shallow gully that defines the northern boundary of the homestead. 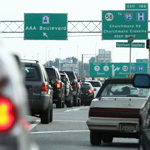 The feature measures approximately 14 feet in diameter and extends three feet below the plowzone (Photo). There are large posts positioned approximately every three feet around the perimeter. Each post rests on a rock to prevent it from rotting. The slabs situated in the middle exhibit signs of trimming or shaping. They are formed from a light green sandstone whose origin is unknown…for now. No other artifacts have been recovered from this enigmatic feature. The lack of artifacts suggest that it may predate the house, as otherwise household refuse would have undoubted been part of the upper fill. So what is it? We have ruled out a well, privy, cistern, spring head, windmill, or silo. One exciting suggestion is that it is a wolf trap. Construction of wolf traps was mandated in this area during the 1680s and 1690s as attempts were made to eradicate wolves as pests. The small crossroads settlement of McDonough, a couple of miles south on what is now Route 13, was originally called “Trap”. Your thoughts, as always, are welcome. We are beginning another excavation on the 301 project! 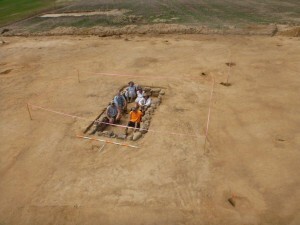 Here is the link to a handout detailing this amazing site. 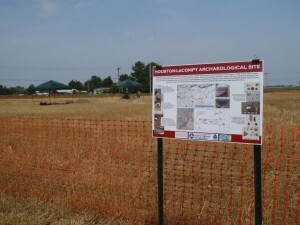 Fieldwork has begun at the Houston-LeCompt archaeological site despite the hot weather. One good thing to come out of the recent storms is that the rain left us with good workable soil conditions. That makes a huge difference when digging in this heat! 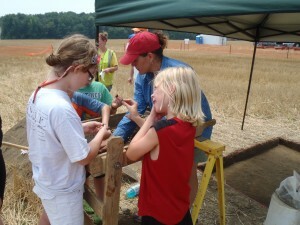 We are about halfway through the process of sampling the plowzone for artifacts. Recovery so far has been very heavy in most of our sample areas, with thousands of fragments of historic ceramics and glassware making up the bulk. While is is sad that so many beautiful objects were broken up by centuries of plowing, it is a testament to how long and how frequently farmers have been working this land. Among those thousand of objects, there are also a few gems, such as half of a tiny teacup from a child’s tea set, a thimble, pennies from the late 1800’s, and a hair pin set. 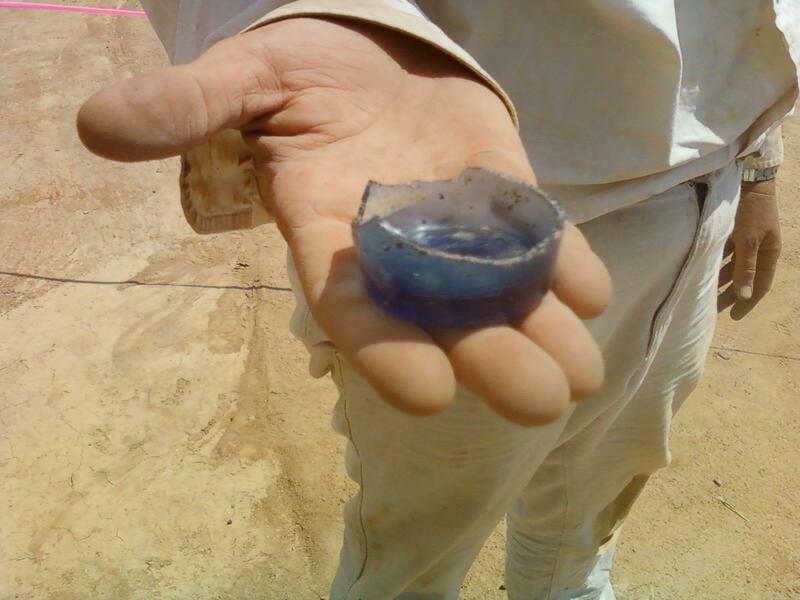 However, it is what is at the bottom of our sample units that is exciting to us as archaeologists. We are seeing features underneath the plowzone, around the area where the foundation and cellar were found during previous work on the site. 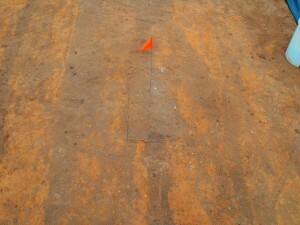 Weather permitting, we will finish plowzone sampling early next week, and begin mechanical stripping of the site. We are hoping that once the backhoe starts clearing large areas, the features we can see now will connect to others, possibly to form outlines of additional outbuildings or fence lines, or expand to reveal trash pits, wells, or privies. With the site located right along Boyd’s Corner Road, we have had curious onlookers and visitors stopping by already. 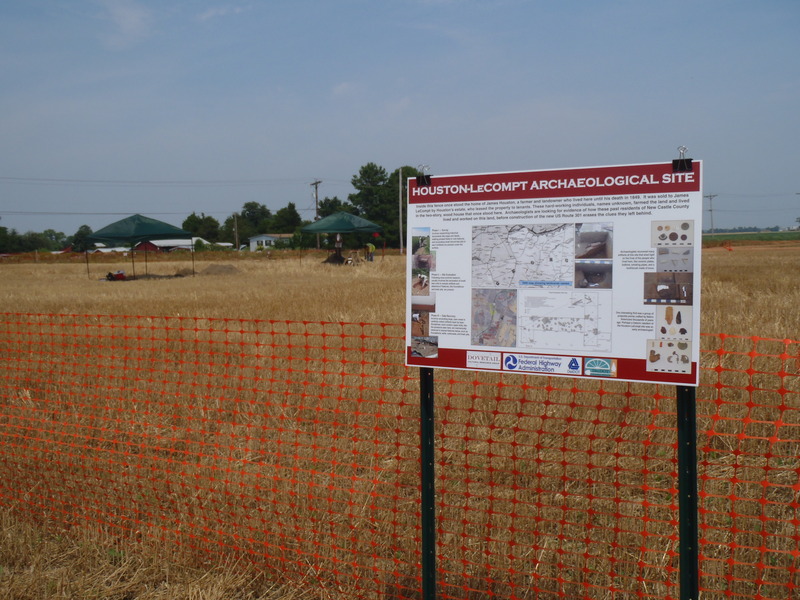 We are looking forward to working with volunteers and helping local residents learn more about both the archaeological process and the people who once lived on this farmland.